Special Guests & Keynote Speakers: Chris Rankin, Christian Coulsen, Team StarKid, Kelvin Tuite, Brendan Doherty, and Fandom-trained Writers: Naomi Novik, Karen Healey, R.J. Anderson, Ali Wilgus, and Sara Rees Breenan. Infinitus, the seventh event by HPEF, took place July 15-18, 2010 in Orlando, Florida – home to the all-new “Wizarding World of Harry Potter” only at Universal’s Islands of Adventure® . As always, registrants experienced our usual strong and diverse program offerings covering topics from Alchemy to Zoology and every subject in between. By the numbers, Infinitus was one of our largest events. It boasted 132 presentations across 9 tracks and 20 programming hours. 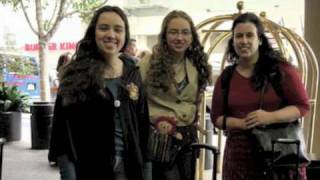 Our unique, once-in-a-lifetime agenda also included the”Night of a Thousand Wizards” on July 16 at the “Wizarding World of Harry Potter”, which gave our attendees exclusive access to explore and immerse themselves in the wizarding world as nobody had before. This was the first time the park was opened after-hours for a major fan event. Most of the programming and events took place at the Loews Royal Pacific Resort at Universal Orlando®. 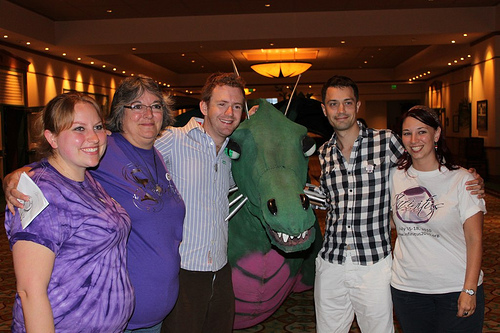 Infinitus Team members with Chris Rankin and Christian Coulson. Infinitus began on Thursday with Wizard Chess, a choreographed performance on the field behind the hotel function lawn outside the conference area, then lead into the afternoon with our Welcoming Feast. Quidditch, as well as Formal and Informal programming, started that afternoon, and the day was rounded off with organized meet-ups, Wizard Rock concerts, activities in the Common Room and Quidditch. Infinitus hosted a Vendor Room, Art Gallery and a Common Room, home to our Fandom Museum. Fans submitetd fanart – drawings, sculpture, costumes, crafts, games, and other in two- or three-dimensional items for our gallery. A craft faire was also held. Wizard Rock concerts included performances from The Remus Lupins, Whomping Willows, House of Black, Ministry of Magic and more. Other magical performances: Lena Gabrielle’s (Fair Fortune: A Wrock Opera) and Mallory Vance’s “The Final Battle”, which was a fully staged musical version of the climactic events of HP and the Deathly Hallows. Also featured was the world premiere showing of the fan film, Harvey Putter and the Ridiculous Premise..
On Friday evening, the celebration moved to the Wizarding World of Harry Potter for Night of a Thousand Wizards, an exclusive event in the Park just for Infinitus attendees. Both Mugglecast and Pottercast hosting a live podcasts. And Saturday’s Keynote Lunch speaker were some of the brilliant minds behind Electronic Arts’ BrightLight Studios Harry Potter games. On Saturday evening, participants enjoyed the “A Very Potter Musical Sequel” premiere with the Billboard-charting Team StarKid, joined Chris Rankin and Christian Coulson for dessert, then met up with everyone at the Ball, which went into the wee hours. Plus, there was more Wizard Rock after the ball, at the Midnight Comedy Slam, which began at 12:30 AM (technically Sunday morning). The Leaving Feast was held Sunday morning along with a charity auction. As always, proceeds went go to charities, including Kids Need to Read and the HP Alliance.